Hippie: “You can’t own property, man! I am currently working my way through an interesting tumblr blog I stumbled upon. Still 2213 postings to go (if I calculate it right), but so far it brought me 2012 interesting graphics and 316 nice quotations (I drag the images on my desktop and move them into a DEVONthink folder and capture the quotes with the DEVONthink text plugin — not only makes storage easy but it also gives me the numbers). And yup, the digital squirrel in me went nuts. Looking at all the interesting (= makes you laugh, think, energized) postings, I was reminded that I wanted to do a posting about non-destructive graffiti. Personally, I love good graffiti, I love quotes in public places, well done images. But I hate tags on buildings and the general destructive nature of it. 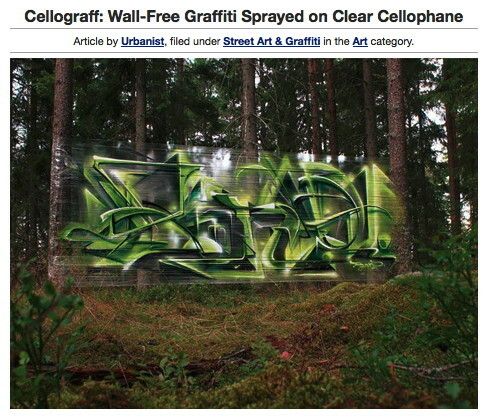 A posting on weburbanist.com shows this incredible idea: Instead of spraying on walls, the artists used cellophane. It can be put on or between almost any kind of objects and sprayed just like a wall. While probably not eco-friendly, it leaves the property of the people intact and puts graffiti where no graffiti was before. Cut from http://499kb.tumblr.com/post/49791201242 (instruction there). 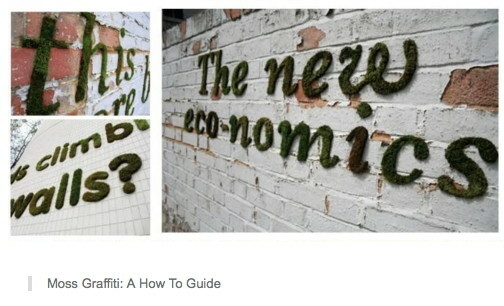 I haven’t tried out the idea (yet), but it seems you can use moss a graffiti substance. Not something for immediate results, but the process is described on the 499kb.tumblr.com blog and it looks — incredible. As long as you can get the misting down it’s an impressive way to leave comments (nature fighting back … anyone?). Using post-it’s a ‘graffiti’ sounds lame — not necessarily. Personally, I love printing good webcomics (the best of the best from Dilbert, Non-Sequitur, PhD-Comics, xkcd, Savage Chickens, and the like) on Post-Its and put them in semi-public places. When I wrote my PhD in the university library, putting excellent comic strips on post-its in different places in the library gave me a sense of … I don’t know … peace? Like I brightened the day for a few of the students … who were working, like me, on a difficult task, and who could use the laugh. Doing it is actually quite easy — simply scale a comic so that it fits on a post-it, print it on the usually sized paper (without scaling it), then put the post-it on top of it and put the paper in the printer again. Make sure that the side with the glue goes first, and print it again. You get a post-it that you can put almost anywhere — and in contrast to the usual toilet wall graffiti it is a) well done and b) does not give the cleaning personnel a hard time. And you can use anything — comics, quotes, images … you name it. next newer posting: I’m a digital squirrel — what are you?